5-pc Torque Extension Kit 31 Inc 14-820 / BOWES TT 37820. The 1/2" Drive Wheel Torque Extension Kit will torque wheel nuts on most foreign and domestic cars and light trucks to the correct torque, the first time, every time, with your thin wall or regular lug nut sockets. Since more vehicles every year have tight tolerances around the wheel nuts, this kit will help eliminate damage to wheels when torquing the wheel nuts. 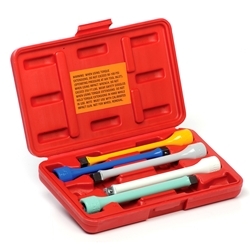 This 5-piece kit includes a wall chart and a custom case.